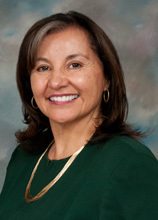 Professor Antoinette Sedillo Lopez has been selected as an inaugural member of the Academic Leadership Academy at the University of New Mexico. The academy is being established by the Office of the Provost as a training ground for future academic leaders. She will begin her fellowship in January 2013. As a UNM Academic Leadership Fellow, Sedillo Lopez will participate in the workings of the Office of the President, the Provost, the Vice President for Research and the Executive Vice President for Administration. She, along with three other fellows, will develop projects and be directly mentored by these administrators. The fellows will participate in both short- and long-term strategic discussions at UNM. They also will be involved in senior-level decision-making meetings and take on assignments and special projects, study organizational structure and governance patterns, observe how decisions are made, who makes them and how leaders communicate their decisions. The initial term of the academy is two semesters and is renewable for two more semesters. Other fellows are: Professor Melissa Bokovoy of the UNM Department of History, Professor Yemane Asmerom of the UNM Department of Earth and Planetary Sciences and Professor Edl Schamiloglu of the UNM Electrical and Computer Engineering Department.